I love waking up on a beautiful sunny weekend morning and making breakfast. One of my favorite breakfasts is homemade granola. It’s easy, delicious and fills the house with the most wonderful aroma of brown sugar and cinnamon. I add just a touch of chili powder for subtle heat. Homemade granola is perfect for a morning parfait of yogurt, fresh fruit or berries topped with some granola. I like to use a good quality of greek low fat plain yogurt. If you prefer a flavored yogurt try mixing it with plain yogurt – 50/50. It makes for a less sweet base for the sweet fruit and granola. From by the bay, wishing you sunny granola mornings! 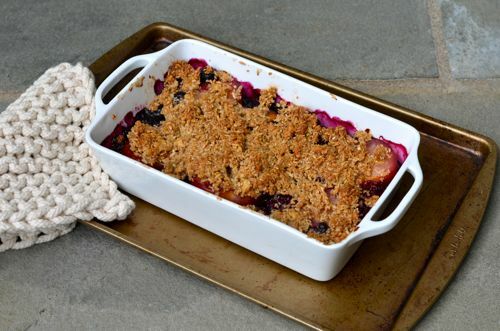 Preheat oven to 300 degrees F. Combine all ingredients except the dried cranberries into a mixing bowl, combine well. On a parchment lined sheet spread ingredients in 1 layer. Bake for 40 minutes until brown stirring every ten minutes until mixture is browned. Remove from oven and cool granola. Once cooled add dried cranberries and mix. Keep in airtight container. It should keep about one week. 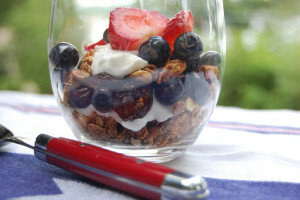 This entry was posted in breakfast, granola and tagged best granola recipe, breakfast recipes, brown sugar recipes, cinnamon recipes, granola recipes, homemade granola, maple syrup, olive oil, pecan recipes on June 17, 2015 by entertainingbythebay.